Smart meter maker Itron and smart grid communications provider Ambient have agreed to link up their technologies and pitch the combination to utilities. Yet another partnership between two smart grid players has emerged – this one between smart meter maker Itron and smart grid communications provider Ambient Corp. The two companies said Tuesday they'll integrate their systems and market the combo to utilities. The integration isn't necessarily a novel concept – Ambient, which makes a variety of communications technologies to link smart meter networks to utilities' back offices, has worked with Itron, as well as smart meter maker Echelon. But the marketing partnership represents a growing trend, in which companies that fit into certain parts of the smart grid puzzle – neighborhood area smart meter networks, distribution automation systems, transmission monitoring systems and the "backhaul" networks that link them to utility control rooms – are getting together. There have been a lot of these announcements in the past few weeks. On Thursday, AT&T said it would provide communications for the voltage and power outage sensors made by Cooper Power Systems (see AT&T Links Cooper Power Systems' Smart Grid Devices). A few days before that, Current Group said it would work with Qwest Communications to link Current's smart grid devices via Qwest's DSL networks (see Green Light post). Smart meter networking technology providers Silver Spring Networks and Trilliant have recently announced ways they intend to integrate smart meters and distribution grid and utility backhaul networks as well – Silver Spring in partnership with grid devices maker ABB and Trilliant with its acquisition of SkyPilot (see Trilliant Buys SkyPilot for End-to-End Smart Grid Communications). That fits in well with utilities' natural desire to work with fewer partners and integrated technologies. It's the same logic that has led to a spate of acquisitions and mergers in the smart grid field over the last year or so, most recently with GridPoint's purchase of Lixar (see GridPoint Buys Home Energy Management Startup Lixar and Acquisitions in Smart Grid: Get Used to It). The Department of Energy has put interoperability high on its wish list for projects applying for $3.9 billion in federal smart grid stimulus grants, likely adding to utility interest in systems that have proven they work well together (see DOE Issues Rules for $3.9B in Smart Grid Stimulus Grants). Itron has also partnered with demand response company Comverge to integrate its systems into Itron's smart meter networks. 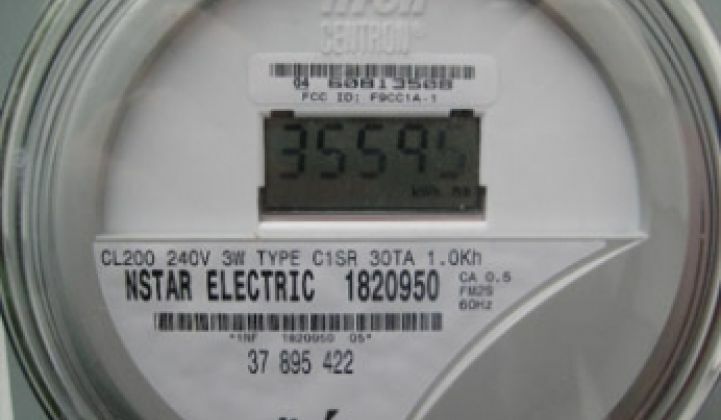 The idea is to power down home appliances, air conditioners and other energy users through smart meters, something that many utility pilot projects are tackling (see The Elusive Smart Meter-Demand Response Combo). And of course, no mention of integrated smart grid systems could neglect to mention Cisco Systems, which in May announced its intentions to provide networking and data management for a wide array of smart grid systems, from distribution automation equipment to home energy management systems (see Cisco Wants to Be Everywhere in the Smart Grid).